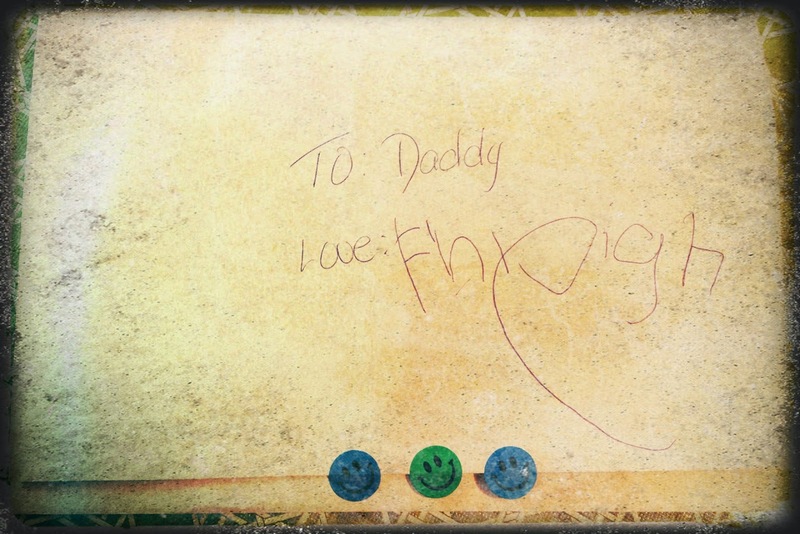 Finleigh's school-made Father's day offering. I've mentioned before, I think, that my husband is a pretty great father. And I'm relatively certain that I have also told you, on a few occasions, that I'm not really sure how I'd get through this thing we call life without him. If I haven't, I've been remiss, because it's true. We don't really celebrate Mother's and Father's day in our house. When the kids are little, it's more about them anyways. Oh'ing and awe'ing over their little school-made gifts and making them feel like they're making us feel special. It's actually a lot of work. And Brian and I are pretty good throughout the year of letting each other know just how much we appreciate each other. Also, we want to recognize our own parents in this whole thing. Plus, working shift work means that Brian is gone every other one anyways. So we don't buy presents or anything... we just try to make each other feel appreciated and loved. But this year, I've taken it to a new level of not celebrating. After going out last night with the girls, today I am up to my ears in homework that really just has to be done. In fact, I even forgot that this Sunday was Father's Day until the other day. So Brian will really be fathering this year on Father's Day. No sitting with his feet up watching TV. No hanging out at the lake. No breakfast in bed. No supper cooked for him. Nope. He'll be entertaining Finleigh all day, while trying not to ignore the boys. Because that's the kind of dad he is. He cares about his kids. He cares about his relationship with his kids. He knows that the time he spends with them is valuable and meaningful. In fact, I often think that he's a better parent than I am. I'm pretty sure I wouldn't be the parent I am were it not for his gentle reminders and his example of pursuing quality relationships with our kids. He's the kind of guy who works a 12 hour night shift and then comes home and runs a garage sale for four hours (including the kids in it all), naps for a couple hours, and then cooks supper for the kids while his wife gets ready to go out. He's the kind of guy who swoops in and saves the day when I'm at the end of my rope... which is often, in case you were wondering. He's the kind of guy, for whom all those "dumb" and "useless" dad stereotypes just don't apply. Not even a little bit. So, this Father's day, I'll write him this disjointed little post that I wrote while trying to let him sleep in. But not too long, because I've got lots of stuff to do.